Strengthening the historic ties between Colorado College and the local community, the Business and Community Alliance provides a forum for Colorado College and local business and community leaders to discuss issues of common interest. What is the Business and Community Alliance? The Business and Community Alliance of Colorado Springs is a group of local citizens who would like to broaden the role of Colorado College in Colorado Springs. As small-business owners, bankers, and corporate and non-profit community leaders, they have joined together to strengthen ties and demonstrate the mutual reliance of each to the other. In a sense, they are “ambassadors” for community relations. Members of the Alliance bring the community to the campus, letting it see firsthand what the college does and how it impacts the Colorado Springs community. The B&CA hosts several events a year, many of which are free of charge, and all of which are open to members of the public. How was the Alliance formed? In the early 1980s, when then-CC-President Gresham Riley wanted to highlight Colorado College to the business community, he formed the Corporate and Business Advisory Committee. 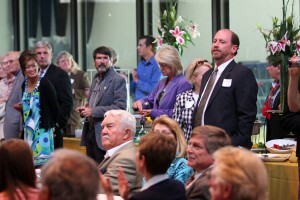 This group of 20 faithfully invited co-workers and business associates to events, building the membership so that now the group has a mailing list of more than 700 who are regularly notified of important events at the college. .
Today, a 25-member board directs the planning of the Business and Community Alliance.